Matisse is the perfect spot for a delicious lunch in a beautiful spot where you can enjoy a quiet meal. The service was impeccable only surpassed by the memorable scrimp salad. Outstanding in every way! We love the atmosphere in Matisse and the service is excellent. The food is good but , but, as always, there is room for improvement. An elegant cozy place with an interesting menu and great staff. Makes me wonder why I have lived ion DC for 40 years and have never heard of it. A wonderful place. Duck is delicious. Beautiful wines. Our first time, and it was exceptional! Everything was superb! Excellent cuisine, great wine selection, impeccable service. Not a single complaint or shortcoming. Can’t wait to go back soon! We have been to Matisse several times and it never disappoints. After moving away from area for 3 years, we dined there this past week to celebrate our return. The kitchen was kind enough to make an entree for me which had previously been on the menu but since removed - such a treat as it had always been my favorite there. So happy to see that the restaurant is what is was when we left - I'm sure we will now continue to visit frequently. As always Call Matisse was lovely. Excellent food and service, a favorite place in D.C. consistently! Great atmosphere, wonderful food and perfect service. Group of five. 4 loved it and vegetarian was disappointed with only option gnocchi. Brought granddaughters for special white tablecloth dinner. They loved every minute. Elegant ambiance, great food and wonderful service. Always wonderful from attentive service to the quality of the food! It is truly a neighborhood gem! We will return and return, thank you! Matisse is a lovely French restaurant in Chevy Chase. It is charming and quiet. We enjoyed the fact that we were able to talk. The food was excellent. We all had fish dishes that were fresh, prepared well with a lovely presentation. Our waiter seemed to forget about us toward the end of the meal. I think overall the service was fine. Our waiter might have been having an off day. We will be back. Matisse represents itself as serving French cuisine. It is anything but French. There are several dishes with homemade pasta and leans toward Italian. Appetizers of fries calamari - more Italian/American; 2) wild mushroom soup no flavor and too thick: 3) mussels lacked garlic, butter and parsley. Entrees were red snapper, roast duck and scallops. Of the 3 only the scallops was somewhat French. All the food we ordered lacked seasoning. Four of us were looking for a nice restaurant to celebrate a special occasion. We had never been to Matisse before but, since we live in Maryland, we didn't want to go all the way downtown. The weather was dreadful - stormy and cold. Fortunately, we couldn't have picked a better spot. There was street parking nearby and it was free (the meters stopped at 6 pm). The restaurant was quiet (hooray!). There was a lovely fireplace in the back room where we sat. Our waitress was helpful but not overbearing. The menu was varied, and we all ordered something different. We shared a reasonably priced white wine, two appetizers, four entrees, and two desserts. My tuna was not quite rare enough, but the lentils and yogurt sauce that it was served with was delicious. Everything else was superb. We lingered for more than two hours. Would definitely go again. My nephew and I really enjoyed the food,it was delicious. The service was wonderful, the server was attentive without being intrusive and the ambiance was lovely. The noise level was low so that you could carry on a conversation. I would normally give 4 stars for food at Matisse but this time the fish (branzino) dish was uninspiring. But the wine special, a bottle of Saint-Estephe, was excellent. Everything was excellent. Great food, beautifully prepared and wonderful service at reasonable prices. Always consistent, a neighborhood gem!!! The food is consistently good, as is the service. We consider it a neighborhood gem!! This is a beautiful space! Charming and quiet which is hard to find these days. The service was just right- enough attention without being overbearing or over friendly. And the food is consistently good. Salads are cold and crisp and salmon done well. Chicken perfectly grilled. And the coffee was not weak as in most places!!! A great place to be able to have a conversation over a good meal. Excellent seafood lunch in this very civilized and friendly neighborhood gem. Steak frites were mediocre, peppercorn sauce seemed to lack peppercorns, poached pear dessert had a similarly bland chocolate sauce. Wine (Oregon Pinot Noir) was excellent, but overall dining experience was not worth repeating. Went for brunch with a friend. The back room with the fire was so nice on such a cold day. The beignets are not to be missed. I could have eaten just those all day! Only suggestion is to be aware that they open at 11:00am for brunch and really don't open the door until 11:00am - probably not a problem for most but I am always early and it can be very cold standing outside. Maybe make your reservation for 11:15am and you will be perfect! We had dinner at Matisse Saturday night. Its a nice ambiance and I like that the tables are not too close to each other so you can talk. But the service was terrible. It took twenty minutes to order and our food took 45 minutes to come out. The waiter looked like he was run ragged constantly having to go from the third floor dining room to the kitchen two levels below. The food was mediocre and prices were pretty high ($27-32 main course, $9 appetizer) with relatively small portions. We always have a superb meal at Matisse and dine there twice or more per month. Clean, fresh, delicious but a light touch in sauces. Best crunchy bread in town. Every dish cooked and presented perfectly. Friendly and knowledgeable staff. The service was polite and professional. The food, especially the Ahi Tuna and the Kale Salad appetizers were extraordinary. It was my wife birthday and they did a really good job. Great dinner and excellent service. Very classy and comfortable. My first time. 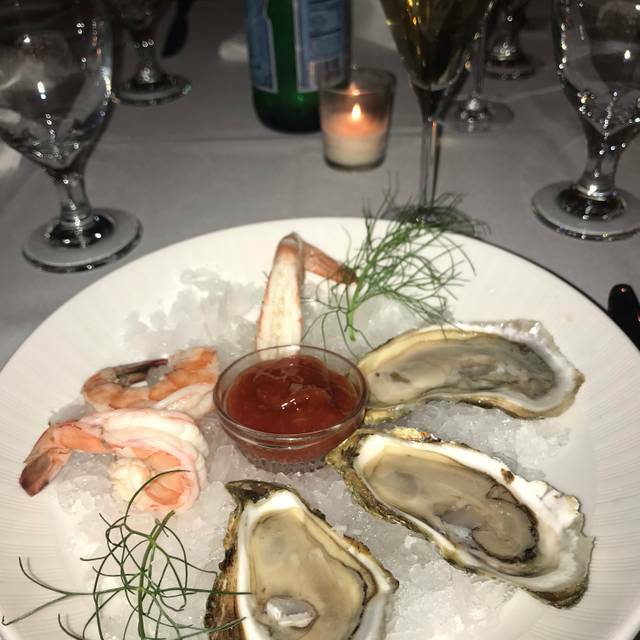 We love Matisse for quiet, romantic evenings out -- calm ambience, excellent food and wine, outstanding service -- Matisse isn't inexpensive, but it provides outstanding value for the cost. We were served in the second floor dinning room. There was a problem there with the wide swings in the temperature at our table. In this day and age there should be a way to better control the temperature for a better dining experience. It was a major problem. Food was acceptable but not up to the standards of other equivalent (price wise) restaurants). Service below average. Great steak and pommes frites at lunch. Prices reasonable. Gracious dining at a modest price. Matisse is a mainstay in the DC restaurant scene. I know Matisse for years and it never disappoints. Staff is very friendly and knowledgeable, food is high-quality and refined, and there are always specials (for dinner) on the menu, that add to a regular menu offering. Wines come in a variety of prices and qualities, but all are good to taste.